One hundred thirty-eight member states voted Nov. 29 to boost Palestine’s status from “entity” to “non-member state” — the same status held by the Holy See — in an implicit recognition of Palestinian sovereignty. Israel, the United States and Canada were among the nine states that voted against the motion. Forty-one countries abstained. The vote reflects the “sentiment of the majority of the international community” in favor of a “more significant presence to Palestinians within the United Nations,” the Vatican said in a written statement Nov. 29. But Palestine’s enhanced status at the U.N. “does not constitute, per se, a sufficient solution to the existing problems in the region,” the Vatican said. Such a solution would require “effective commitment to building peace and stability, in justice and in the respect for legitimate aspirations, both of the Israelis and of the Palestinians,” it said. Israeli and Palestinian leaders need to restart peace “negotiations in good faith and to avoid actions, or the placing of conditions, which would contradict the declarations of good will and the sincere search for solutions which could become secure foundations for a lasting peace,” it said. 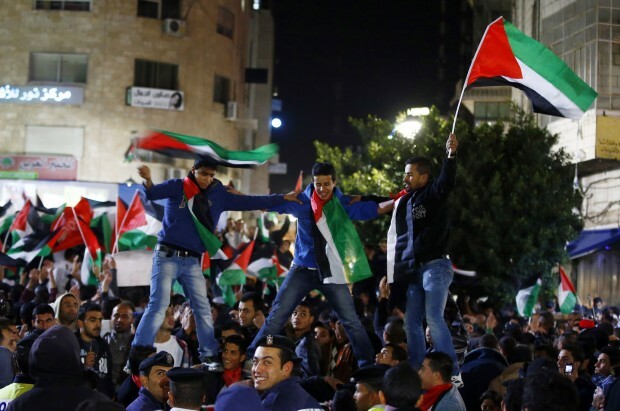 In the West Bank, church bells rang out as the announcement of the U.N. decision was made. The agreement aims to safeguard “the freedom of religion and of conscience, the identity and sacred character of Jerusalem as a holy city, (and) respect for and freedom of access to its holy places,” the Vatican said. Palestine’s enhanced status gives it the right to speak at U.N. meetings and sponsor and sign resolutions, but not to vote on U.N. resolutions. Nonmember observers may petition to join the body as full members. Meanwhile, the Israeli Embassy to the Vatican said the U.N. motion was merely “symbolic” and that the general assembly does not have the power to confer statehood. The Nov. 29 resolution “does not, and cannot, establish a Palestinian state or even grant it recognition,” the embassy said in a Nov. 30 statement. At present, 131 of the 193 U.N. member states have recognized the state of Palestine. “Israel is prepared to live in peace with a Palestinian state. However, for peace to endure, Israel’s security must be guaranteed: The Palestinians must recognize the Jewish state and they must be prepared to end the conflict with Israel,” the embassy said. The Vatican said in its statement that the currently unresolved question of Palestinian statehood was already addressed in U.N. Resolution 181, which was passed on Nov. 29, 1947 — exactly 65 years to the day of the Palestinian observer status vote. The United Nations’ Partition Plan for Palestine is the “juridical basis for the existence of two states, one of which has not been constituted in the successive 65 years, while the other (Israel) has already seen the light,” the Vatican said.